Long, healthy hair never goes out of style. Ever since I was young, I remember being enamored by movie stars, my favorite singers, and everyday women with long, luscious hair. There’s something about it that oozes confidence and sultry beauty. But only if it’s taken care of correctly. 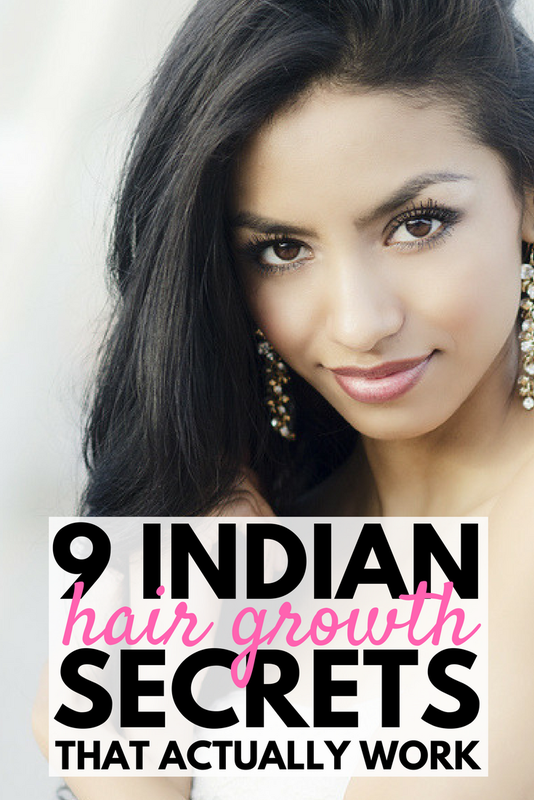 Having strong, thick hair that grows fast is the ideal for most women, and these Indian hair growth secrets will skyrocket your hair growth rate like never before! I’ve never had issues growing my hair, but I have so many friends that can’t grow their hair past a certain length (usually right around the shoulders). Whether they’ve colored it too many times, or have really thin, delicate hair, whenever they try to grow it longer, it either breaks off or just won’t grow. Time after time I’ve heard friends and family members complain about their stunted hair growth and how upset they are that they can’t have the long locks they desire. I knew there had to be some helpful hair growth secrets for them to incorporate into their daily regime. The secret to growing long hair isn’t complicated! Follow these 9 natural hair growth tips that work! Rinse Your Hair with Cold Water. Everyone loves a nice, warm shower, but if you want your hair to grow long, you’re going to have to get used to rinsing it with cold water. Cold water closes the hair’s cuticle and stimulates blood circulation, which leads to faster hair growth. It also helps seal in moisture from your conditioner, making your hair shiny and healthy. You can definitely start off with a warm shower, just make sure that at the end, you rinse your hair with cold water. Use Essential Oils. There are certain essential oils that work great for hair growth and strengthening. Rosemary oil, horsetail plant oil, cedar wood oil and lavender oil are extremely beneficial for your hair, providing it with the benefits it needs to grow. They stimulate hair follicles and increase circulation of the scalp, encouraging hair growth. Get Regular Trims. If you think it’s counterintuitive to cut your hair while you’re trying to grow it out, think again. Getting your hair trimmed regularly (at least once every 3 months) is key to healthy hair growth. Trimming your hair will get rid of any split, damaged or broken ends you have, quickening hair growth, rather than hindering it. Don’t Wash Your Hair Everyday. Washing your hair everyday can strip away excess moisture from your scalp, leaving it dry and even flaky. Washing your hair twice a week is a good rule of thumb to keep your hair safe from dryness. If you feel like you need to wash it more than twice a week, stick to every other day, but not every day. Here are some tips to help you prolong a hair wash and still look gorgeous! Feed Your Hair. There are certain foods that are amazing for your hair! Add them to your diet and you’re one step closer to natural healthy hair growth. Salmon is one of the best foods for your hair since it contains vitamin D, protein and omega-3 fatty acids, all of which keep your scalp healthy and promote hair growth. Sweet potatoes are another food that encourages hair growth since they’re filled with beta carotene, the precursor to vitamin A. Other awesome hair foods include yellow peppers, eggs, almonds and avocados. Use Coconut Oil. Coconut oil is a super food for so many reasons, and it’s one of the best fast hair growth secrets. Before you hop in the shower, lather your hair with coconut oil and let it sit with a shower cap on for 30 minutes to an hour. Coconut oil is packed with vitamins and essential fatty acids that nourish the scalp and remove sebum build-up that comes from hair follicles. It stimulates hair growth and helps it grow faster and thicker. Massage Your Head. While you’re washing your hair, massage your head at the same time. This ensures circulation and keeps blood flowing to your hair roots. Rather than just lathering on the shampoo and rinsing it out, gently apply pressure with your fingers in a circular motion on your scalp to stimulate the hair follicles so your hair grows faster. You can also give yourself a head massage with any of the oils we talked about above. Treat Your Hair to a Protein Mask. You can easily make a hair mask at home with items from your fridge and pantry. The easiest one can be made with just two eggs and two tablespoons of olive oil. You can add water if you need to dilute the stickiness. Eggs are amazing for strengthening and nourishing your hair due to lecithin and protein, so apply the mask to dry, untangled hair and let it sit for 30 minutes. Use Aloe Vera. Aloe Vera is another awesome secret for growing your hair. It’s chockfull of amino acids and proteolytic enzymes that improve scalp health and encourage faster hair growth. It also controls hair shedding so your hair stays thick and voluminous, and it nourishes your hair follicles through protein, vitamins and minerals. Aloe Vera also has a high moisture content, ensuring your hair stays conditioned and hydrated, which is key to hair growth. You can make a pure Aloe Vera hair mask by slicing an Aloe Vera leaf, scooping out the gel, and running it through a food processor for a smooth consistency. Want more tips for hair growth? 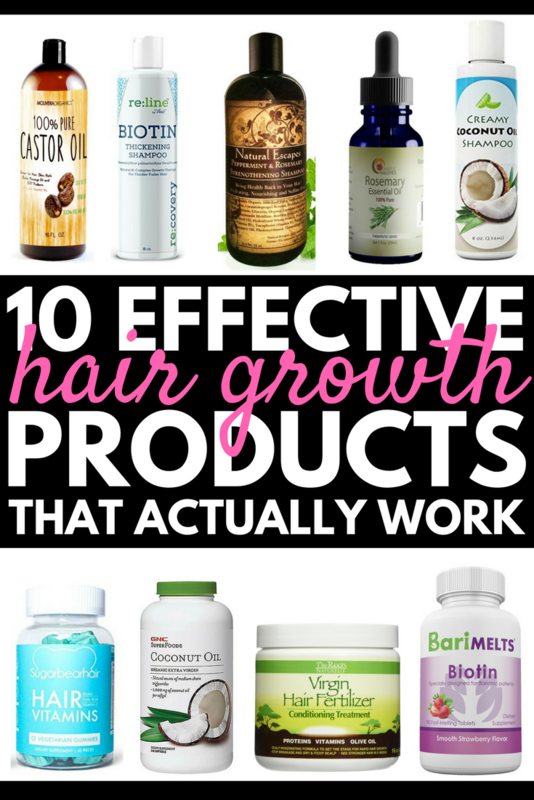 Here’s a list of products that make hair grow longer! These hair growth products, along with the 9 amazing Indian hair growth secrets will be key to making your hair long and healthy. Follow these natural tips for amazing results you’ll love! If you liked these Indian hair growth secrets, please share them on Pinterest! And if you’re looking for more hair tips and tricks, please follow our Fab Hair board on Pinterest!